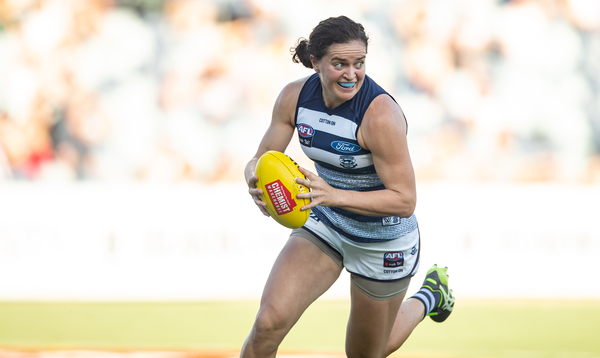 Powerhouse defender Meg McDonald has capped off a stellar season in the blue and white, claiming Geelong’s inaugural AFLW best and fairest last week. The 27-year-old polled 182 votes out of a possible 210, 14 votes clear of runner-up Olivia Purcell. McDonald was also named in a 2019 Virgin Australia AFL Women’s All Australian team last week, making her the first Geelong player to feature in the side. The former Western Bulldogs defender managed only four AFLW games for the Dogs in 2017 before her delisting at the end of the season. In 2018 McDonald enjoyed a standout year in the VFLW, securing a position in the VFLW Team of the Year. Looking for a new home, McDonald signed to the Cats for their inaugural AFLW season and played every game across 2019. The 177cm tall defender finished 2019 as Geelong’s leading disposal winner with 126 disposals for the season and was named in the best in the Cats preliminary final loss to Adelaide. With her intercept marking arguably among the best in the competition, McDonald was one of six players in the league to be selected in the AFLW Team of the Week five times out of seven rounds. Geelong’s Best & Fairest runner-up Purcell also had a breakout first season in the AFLW, while cross-coders, Renee Garing and Maddy McMahon tied in third place on 157 votes. Captain Mel Hickey was awarded the Hoops Award for her contribution to the club, while Kate Darby was awarded the Community Champion Award for her ongoing community involvement.